Well this isn't exactly subtle. 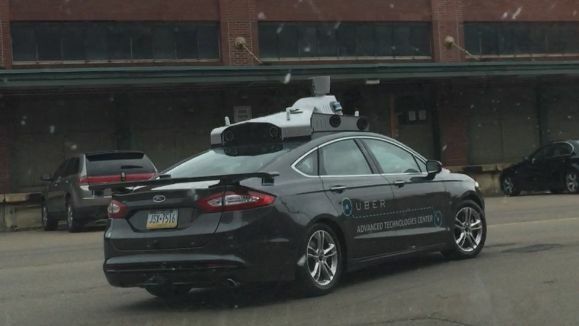 Uber has previously made clear its plans to make self-driving cars part of its fleet, and now proof has been spotted in the wild. How do we know? Because it has 'Uber Advanced Technologies Centre' written down the side in massive letters, along with a box of electronics on the roof. The FBI Uber isn't. The car was spotted cruising the streets of Pittsburgh by the Pittsburgh Business Times. It says the device at the very top of the car was rotating, so it's most probably a LIDAR sensor mapping its surroundings. Google's autonomous vehicles use the same equipment. However, the car itself isn't autonomous, but is being used to research what's possible. "This is not a self-driving test car," Uber said in a statement to The Verge. "This vehicle is part of our early research efforts regarding mapping, safety and autonomy systems." So again, it has confirmed it's looking into the area of self-driving cars. Uber has set up a research centre in a strategic partnership with Carnegie Mellon University's robotics centre right there in Pittsburgh. It also plans to lease a 53,000 square foot facility in which to conduct research. If self-driving cars do get the green light – and it looks like a question of when, rather than if – expect Uber to be the first to sign them up. It's already undercut taxi drivers in what is either a genius business move that benefits the consumer, or a ruthless undermining of a centuries-old profession, depending on your point of view. We can't see it hesitating to cut its own drivers out of the equation if it means more money. The service has proved controversial, and is banned in Germany, the Netherlands, Nevada and a few other places around the world. Google, meanwhile, has just put its first self-driving cars out onto California's roads.